The engineering vehicles that were fired upon are being used to build an underground barrier around the Gaza Strip, which is meant to counter Hamas’s network of border-crossing attack tunnels. Terrorists shot at civilian vehicles that were being used in the effort to construct the barrier around the security fence in the northern Gaza Strip. One vehicle was hit,” the Israel Defense Forces said. Just after 7:30 p.m. terror factions in the Gaza Strip began firing rockets and mortars at Israeli civilian communities near the border, two of which hit Sderot, causing shrapnel injuries to two residents. By 10:30 p.m. 36 projectiles had been launched, four of which were intercepted by the Iron Dome missile defence system. More residential buildings were hit overnight, as well as factories, in attacks claimed by Hamas and supported by the Palestinian Islamic Jihad. The attacks continued throughout the night and by 6 a.m. the next day, over 150 projectiles had been launched, 25 of which were intercepted, with five civilians injured – one seriously – and some 14 others treated for shock. 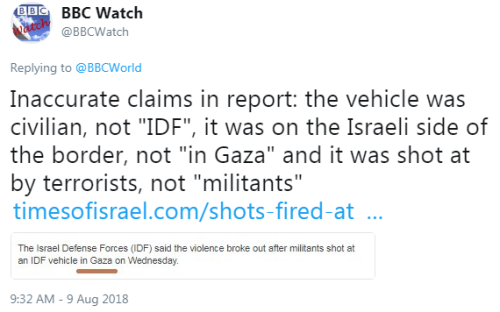 In response, the IDF conducted air strikes on terrorist sites in the Gaza Strip. 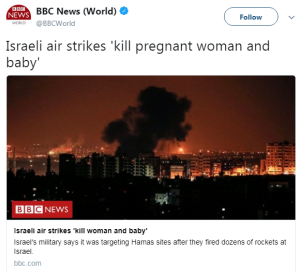 The Hamas-run health ministry reported that three people had been killed – one a Hamas operative – and six injured in those strikes. At the time of writing, the attacks against Israeli civilians continue. 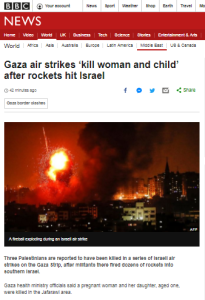 Over twelve hours after those missile attacks against Israeli civilians had begun, the BBC News website published a report titled “Israeli air strikes ‘kill woman and toddler’” on its main homepage, its “World” page and its “Middle East” page. Air strikes by Israel’s military on the Gaza border have killed three people including a pregnant woman and her toddler, the Gaza health ministry says. Israel launched strikes on Wednesday after dozens of rockets were fired into Israel territory by Hamas. Three Palestinians are reported to have been killed in a series of Israeli air strikes on the Gaza Strip, after militants there fired dozens of rockets into southern Israel. 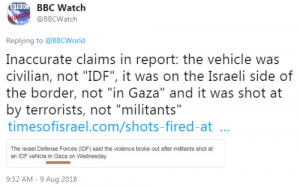 The Israel Defense Forces (IDF) said the violence broke out after militants shot at an IDF vehicle in Gaza on Wednesday. As BBC Watch pointed out to the BBC on Twitter, that sentence alone includes three inaccuracies. The article’s last four paragraphs were copy/pasted from a report published two days earlier on the BBC News website and once again BBC audiences saw a tightly framed portrayal of the ‘Great Return March’ publicity stunt which whitewashes its violence and downplays the role of terror factions in its organisation and execution. 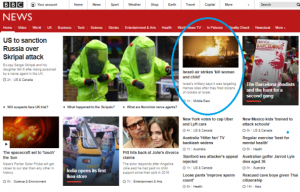 This article originally appeared at CAMERA’s BBC Watch.